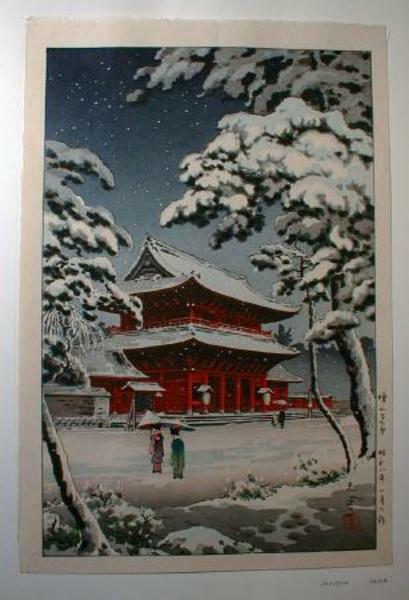 Japanese woodblock print by Koitsu Tsuchiya (1870-1949) entitled “Snow at Zojo Temple.” Originally published in 1933; margin is dated “Showa 8.” Later Hama impression posthumously printed from Koitsu’s original blocks. These later editions are identical to the earlier editions except for the publisher’s seal. With their intense realism, Koitsu’s woodblock prints have immortalized his country’s scenic beauty. Subtle effects of light and shadow endow his scenic renderings with an aura of captivating beauty, making his prints highly prized among collectors. 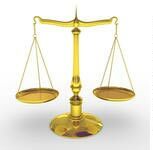 The workmanship in both carving and printing is very good. 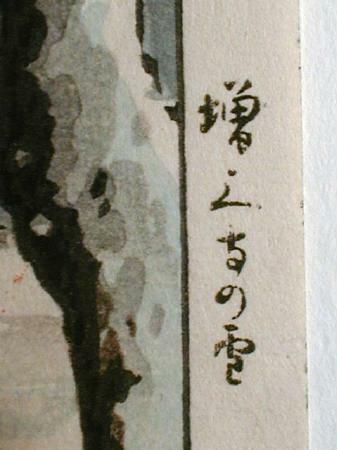 Skillfully executed changes of color shading ("bokashi") are seen throughout the print. 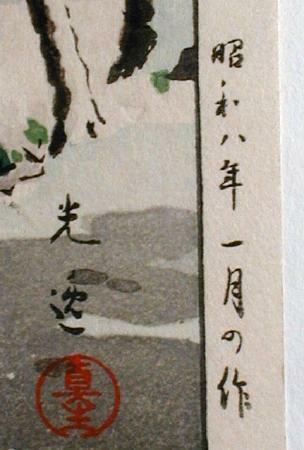 Pristine condition, with excellent color and registration, and strong ink bleed through. Oban size image measures14 ¼” 9 ¼”, plus full margins.